The Koutoubia Mosque or Kutubiyya Mosque (Arabic: جامع الكتبية‎ Arabic pronunciation: [jaːmiʕu‿lkutubijːa(h)]) is the largest mosque in Marrakesh, Morocco. The mosque is also known by several other names, such as Jami' al-Kutubiyah, Kotoubia Mosque, Kutubiya Mosque, Kutubiyyin Mosque, and Mosque of the Booksellers. It is located in the southwest medina quarter of Marrakesh. The mosque is ornamented with curved windows, a band of ceramic inlay, pointed merlons, and decorative arches; it has a large plaza with gardens, and is floodlit at night. The minaret, 77 metres (253 ft) in height, includes a spire and orbs. 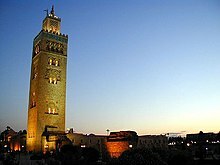 It was completed under the reign of the Berber Almohad Caliph Yaqub al-Mansur (1184 to 1199), and has inspired other buildings such as the Giralda of Seville and the Hassan Tower of Rabat. The Koutoubia Mosque is located by the Jemaa El Fna souq. The mosque is located about 200 metres (660 ft) west of the city’s the Jemaa El Fna souq, a prominent market place which has existed since the city's establishment. It is situated on the Avenue Mohammed V, opposite Place de Foucauld. During French occupation, the network of roads was developed with the mosque as the central landmark, in the ville nouvelle. To the west and south of the mosque is a notable rose garden, and across Avenue Houmman-el-Fetouaki is the small mausoleum of Yusuf ibn Tashfin, the builder of Marrakesh, a simple crenellated structure. In the mosque's esplanade, which backs onto Jama el Fna, the ruins of the original mosque can be seen. Koutoubia Mosque's minaret tower is a landmark of Marrakesh. All the names and spellings of Koutoubia Mosque, including Jami' al-Kutubiyah, Kotoubia, Kutubiya, and Kutubiyyin, are based on the Arabic word koutoubiyyin, which means "bookseller". The Koutoubia Mosque, or Bookseller's Mosque, reflects the honorable bookselling trade practiced in the nearby souk. At one time as many as 100 book vendors worked in the streets at the base of the mosque. The city of Marrakesh was captured by Almohads after the death of the Almoravid leader Ali ibn Yusuf in 1147. The Almohads did not want any trace of religious monuments built by the Almoravids, their staunch enemies, as they considered them heretics. Abd-al-Mu'min, who won the territory, was responsible for building the first Koutoubiya mosque on the grounds of the former palace of Ali ibn Yusuf in the southwest quarter of the medina. This first mosque was built between 1147 and 1154 and completed in 1157. This initial mosque was rebuilt under the Almohad Caliph Yacoub El-Mansour, as it was realized halfway through construction that the mihrab (prayer niche) was misaligned and not oriented towards Mecca, and underwent many changes until the end of the 12th century, when the Andalusians defeated the Almohad dynasty. The alignment problem was a minor issue, as devotees could always adjust the direction when offering prayers in the hall, but the decision was taken to build a new mosque alongside the first structure. The first mosque was completed while the second mosque was undergoing construction. The second mosque was built identical to the first except for its orientation. The layout, architectural designs, inscriptions, dimensions and materials used for construction were all the same. The minaret plan and design remained the same in both buildings. While in the first mosque, the orientation of the mihrab was 5 degrees out of alignment with respect to the direction towards Mecca, in the second mosque, the orientation was 10 degrees off, thus actually further out of alignment with Mecca than the first mosque. Both these structures were built during the rule of Abd al-Mu'min (reign 1130–63). The second mosque was started after 1154 and the building was partially completed by September 1158, with the first prayers held in the mosque at that time. It was completed by the 1190s, though reported completion dates vary between 1162, 1190 and 1199. The first mosque eventually deteriorated. It is apparent that the second mosque was not built as an alternative to the first one, as the two mosques shared the same site for 30 years before the first mosque became derelict.<refnd created the building in a functional style rather than the more ornate Umayyad architecture style. Outside the plaza of the mosque, in a depression which in the 11th century contained remnants of the reservoir of Dar El Hajir (House of Stone), destroyed by the invading Almovids who then built the mosque on its site, are the ruins of an old fort built by Yusuf ibn Tashfin. Buildings were demolished within the enclosed fort area to make way for development of the city. The Koutoubia Mosque and tower constitute the oldest and most complete structure of the Almohad period. The mosque was followed by two other structures built on the same pattern, the Tour Hassan in Rabat and the Giralda in Seville, Spain. This structure thus became the forerunner of Moroccan-Andalusian architecture. Non-Muslims are not allowed inside the mosque; however, they are permitted to visit the Tin Mal Mosque, built on the lines of Koutoubia Mosque. The mosque is made of red stone, formerly plastered, and has six rooms in succession, one above the other. It was designed so as to prevent anyone gazing in from the minaret to the harems of the king. Even in the modern day, such restrictions are enforced by blocking Google Earth access to Moroccans. Architectural details of the old mosque and the new mosque are identical except for the orientation. Hence, what is true of one holds true for the other, though the first mosque is now derelict. It is designed in a traditional Almohad style and the tower is adorned with copper globes. The building, of bricks and sandstone, measures 80 metres (260 ft) in width towards the east and 60 metres (200 ft) to the west along a north to south direction. Brick work is found in the columns, arcades, middle of the qibla wall, and niche of the mihrab. Sandstone is used for the external walls built in the southern, eastern and western directions. The stone wall on the northern side abutted the old Almoravid fortress wall. The surfaces are enlivened by simple designs. All window sections have horseshoe-shaped and multifoil arches, arranged within a rectangle. A diamond shape is formed in the upper part as result of overlapping arches in woven design. Faience strips are provided with bricks in turquoise colour projecting out of the wall, in smaller decorative forms. Austere kufic script is also seen. The sahn or courtyard is 45 metres (148 ft) wide, the same width as the nine central naves. There is an ablution fountain at the center of the courtyard. There are four entrances to the mosque, of which three open directly into the prayer hall while one opens into the courtyard. There is also an additional public entrance to the sahn from the north wall, along the central axis. The front elevation faces the street where book shops were located, hence the name "Booksellers' Mosque". There are two other private entrances to the mosque, one for the imam on the left side of the mihrab and the other for the Prince to enter directly into the maqsura. There are six interior rooms, one above the other. Wrapping around them is a ramp which can be used by the muezzin to reach the balcony. The prayer hall is in a "T" shape. It is large, to the south, and abuts the courtyard at its northern end. The prayer hall is a hypostyle with more than 100 columns which support horseshoe-shaped arches along the parallel naves. The mihrab niche is on the qibla wall in the prayer hall along the widened central nave, for which entry is from the courtyard. There is a wide transverse nave that is aligned along the qibla wall at the south end of the prayer hall. Three wide central naves are aligned perpendicular to the hall to the north. The central naves are flanked by seven smaller parallel naves. In all, there are seventeen parallel naves. The longitudinal naves, about 36 metres (118 ft) in length, are six times the width of the large transverse nave. The extensions of these naves are from the four outermost naves on either side of the prayer hall annexes and the courtyard. The minbar was designed by engineer al-Hajj Ya'ish of Málaga. It is carved in sandalwood and ebony with ivory and silver inlay work. It is regarded as “one of the unsurpassed creations of Islamic art.” This structure is triangular in shape with the hypotenuse end provided with steps. It is 3.5 metres (11 ft) long, 0.9 metres (2 ft 11 in) wide, and 3.9 metres (13 ft) tall. It was made in a workshop in Cordoba in the 11th century at the orders of Ali ibn Yusuf, and is considered a masterpiece of Andalusian decorative crafts. On the triangular faces, there is a 6 centimetres (2.4 in) wide band of Koranic inscriptions in Kufi script on blackwood and bone, with wooden marquetry. It was originally located in the first mosque and was later shifted to the second mosque where it remained until 1962, when it was moved to the El Badi Palace. The minaret is designed in almohad style and was constructed of sandstone. It was originally covered with Marrakshi pink plaster, but in the 1990s, experts opted to expose the original stone work and removed the plaster. The minaret tower is 77 metres (253 ft) in height, including the spire, itself 8 metres (26 ft) tall. Each side of the square base is 12.8 metres (42 ft) in length. The minaret is visible from a distance of 29 kilometres (18 mi). Its prominence makes it a landmark structure of Marrakesh, which is maintained by an ordinance prohibiting any high rise buildings (above the height of a palm tree) to be built around it. The muezzin calling the faithful for the adhan (prayer), is given from the four cardinal directions at the top of the minaret. Its design includes a high angular shaft with a smaller but identical superstructure resting on it, topped by a dome. Many features of the minaret are also included in other religious buildings in the country, such as a wide band of ceramic tiles, alternate pattern work on each side, and Moorish-styled scalloped keystone arches . Decorative carvings envelop the arched fenestrations. Above four-fifths of its height, the minaret has stepped merlons capping the perimeter of the shaft, at which level there is an outdoor gallery approached by ramps. Each side of the tower is designed differently as the window openings are arranged at different heights, conforming to the ascending ramp inside the minaret. The minaret is topped by a spire. The spire includes gilded copper balls, decreasing in size towards the top, a traditional style of Morocco. There are multiple legends about the orbs. One such legend states that the globes were originally made of pure gold, and there were at one time only three of them, the fourth having been donated by the wife of Yaqub al-Mansur as penance for breaking her fast for three hours one day during Ramzān. She had her golden jewelry melted down to form the fourth globe. Another version of the legend is that the balls were originally made entirely of gold fashioned from the jewellery of the wife of Saadian Sultan Ahmad al-Mansur. There is a flag pole next to the copper balls forming the spire, which is used for hoisting the religious green flag of the Prophet, which the muezzin does every Friday and on religious occasions. The floodlit tower has pleasant views at night. Wikimedia Commons has media related to Koutoubia Mosque. ^ a b c d e f g h i j k l m "Jami' al-Kutubiyya". ArchNet. Archived from the original on 6 June 2013. Retrieved 5 October 2012. ^ Fodor, 's (2007). Baedeker Morocco. Random House Digital, Inc. ISBN 9781400017263. Retrieved 5 October 2007. ^ a b c d Clammer, Paul (2009). Morocco. Lonely Planet. p. 299. ISBN 9781741049718. Retrieved 5 October 2012. ^ a b c d Humphrys, Darren (2010). 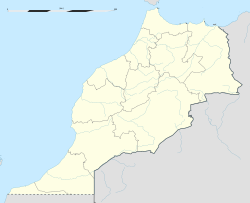 Frommer's Morocco. John Wiley & Sons. ISBN 9780470560228. Retrieved 5 October 2012. ^ a b c d Lehmann, Ingeborg; Henss, Rita; Szerelmy, Beate; Nosbers, Hedwig; Zakrzewski, Reinhard (2012). Baedeker Morocco. Baedeker. pp. 292–293. ISBN 9783829766234. Retrieved 5 October 2012. ^ a b c "Koutoubia Mosque". The New York Times. 5 October 2012. Archived from the original on 19 November 2012. Retrieved 5 October 2012. ^ Gregg, Gary S. (15 February 2007). Culture and Identity in a Muslim Society. Oxford University Press. p. 62. ISBN 978-0-19-531003-0. Retrieved 7 October 2012. ^ a b Calmejane, Christian Beres (20 April 2009). American Silhouettes: A Tale of Anguish. AuthorHouse. p. 87. ISBN 978-1-4389-5996-2. Retrieved 7 October 2012. ^ Searight, Susan (1 November 1999). Maverick Guide to Morocco. Pelican Publishing. p. 398. ISBN 978-1-56554-348-5. Retrieved 7 October 2012. This page was last edited on 20 April 2019, at 21:07 (UTC).